Opinion & Humour | 6log - How does that work then? 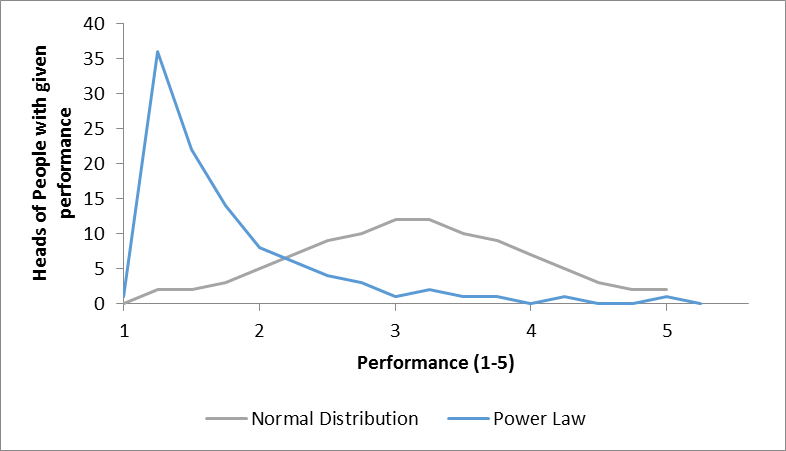 I was rather interested to see a post on LinkedIn recently about “The Myth of the Bell Curve” which was saying (relatively) recent research had shown that human performance is more like a Power law distribution, than a Normal distribution. The consequences of this is that a cherished HR sacred cows needs slaughtering. 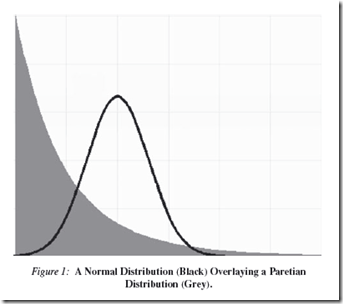 Anyway you can read the post yourself, however, what tickled my interest is what would the two distributions look like when laid next to each other. …but that must be mathematically wrong, surely! 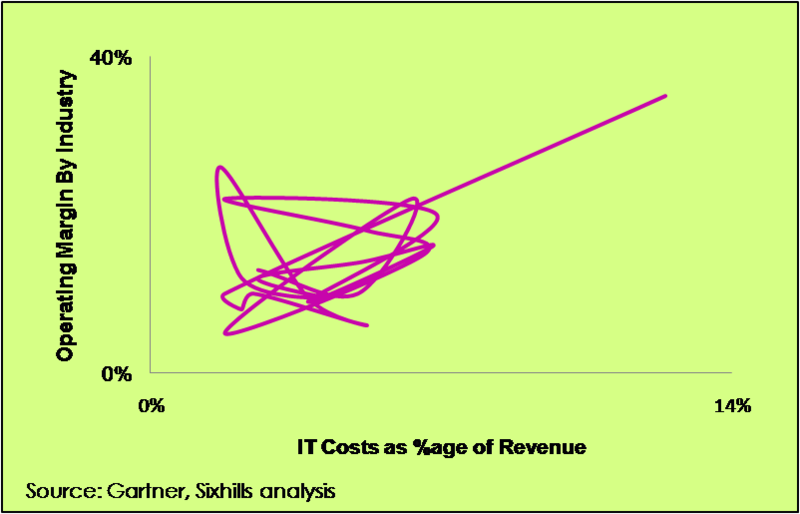 The problem of comparing these two is is that you need to rework the data to get both on the same axes. 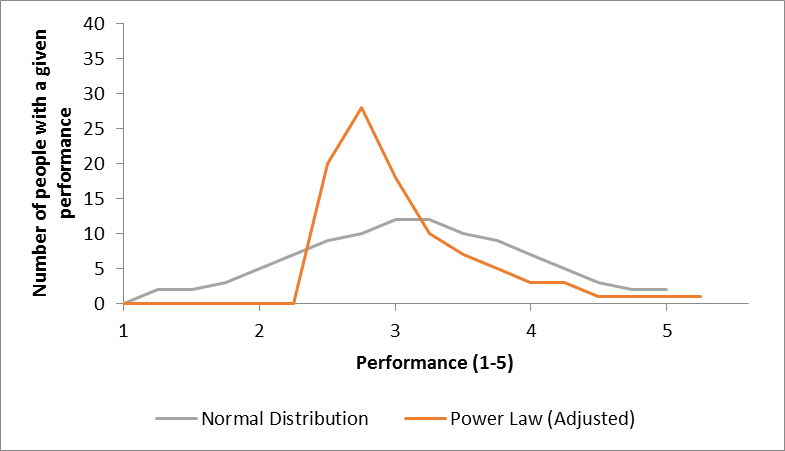 Making the hypothesis that the x-axis of the Power Law is the performance rank of an individual – like a Zipf curve equivalent. 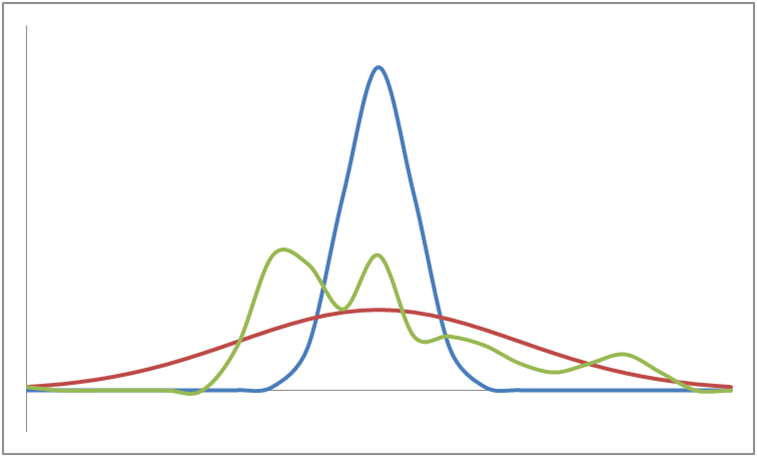 …which might superficially look like the picture at the top, but is actually showing the population of the long tail as the tall spike, not top performers. Still a rather scary picture, as it indeed suggests that most of the people in the “team” are rather serious under-performers, hanging on the coat-tails of the many fewer high-flyers! …which even still suggests that there are a load of sub-middle slackers sitting on their hands, and they should really get moving and DO SOMETHING! My general theory that if when leaving the house on the way to work in the morning, you harbour the thought that “today, “I will not make a difference”, go back indoors and get back under the duvet. 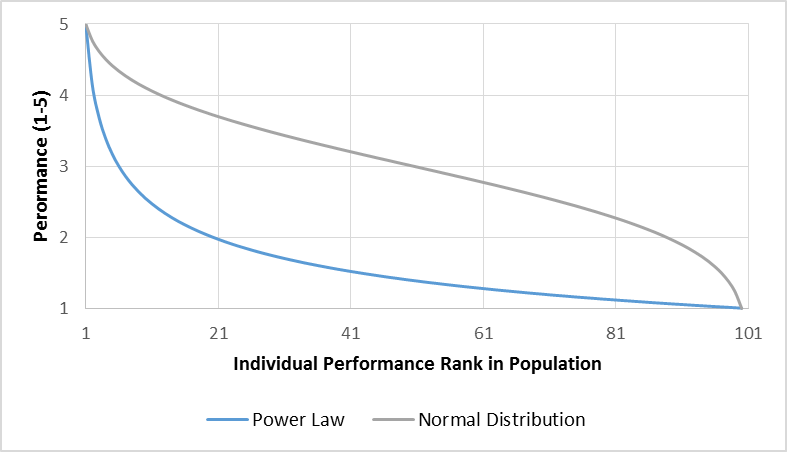 This entry was posted in Original and tagged Bell Curve, Making a Difference, Opinion & Humour, Power Law on February 21, 2014 by andy. Unbalanced reporting, or just unbalanced? Jonathan Swift was on to something when he picked out in Gulliver’s Travels the pointless and apparently irreconcilable Big-Endian / Little-Endian debate on the island of Lilliput (a metaphor for religious schism in 16th and 17th century England, as it happens). The question “Are you a Morning Lark or Night Owl?” is another of those that has its merry bi-band of quarrelsome, bifurcated and dichotomous disputants, bickering and unable to arrive at any accommodation, mutual agreement or consensus view. That’s not what the study actually says, as it just focuses on three personality characteristics (The Dark Triad) and their distribution amongst Chronotypes and so does not equally point to any irksome, venal, or other unpleasantness of the early risers. However when did balance ever come into the equation in getting a headline? Didn’t Mark Twain say “Never let the facts get in the way of a good story”. Did he or didn’t he, I don’t know, does it really matter, is it something people have a fight over, well let them! So the study may have been a bit narrow in scope, but still science (assuming the peer reviewers also agreed about this), and sadly abused by a rather unbalanced headline. The Boston Grid is a good example that expands thinking to at least two (binary, smoothed, averaged) dimensions and has four outcomes (or more if you start sub-dividing the individual boxes, but that gets hard to read, and clarity of thinking is, of course, the whole point, not “clever” smart aleck chart drawing). Binary decision constructs are generally (*see footnote) grossly over-simplified and massively averaged “big picture” way of thinking about stuff, and most situations are actually formed from a spectrum of factors, which the human mind reduces ad absurdum to “are ye wi’me or agin me”. Someone once said that I “hoover up complexity” which was, I think, a compliment overall, on balance, and in the general scheme of things, but also a cogent warning to avoid rocket-scientist gibberish, too! 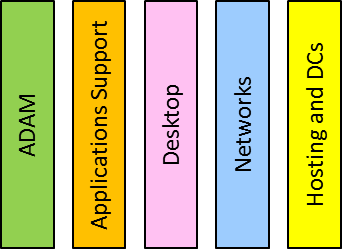 Even a well-meaning spectrum view can still present a one sided and possibly biased picture, and the balancing aspects need to be added. The Autism spectrum is an example of what can be considered as a one-sided spectrum, since “Normal” sits at one end, not in the middle like a properly balanced continuum. I rather liked this view Psychosis and Autism as Diametrical Disorders of the Social Brain: converging evidence!! that describes a wider spectrum from Schizophrenia through “Normal” to Autism. The real story is probably nearer to a 2D surface, or in fact many more dimensions, but that does start to hurt a little bit. Ok, so putting “generally” against any assertion is one of those averaging and simplifying devices used to smooth over the roughness of real-life situations. But what the heck, this is rhetoric, and I stand my ground, Sir! This entry was posted in Original and tagged autism, balance, Lark, Opinion & Humour, Owl, schizophrenia, spectrum on July 31, 2013 by andy. I have been away from my desk quite a lot recently cavorting around the motorways of England, racking up the miles on my poor hard-worked steed, but now I have a few minutes to sit down and pass on an interesting observation…. 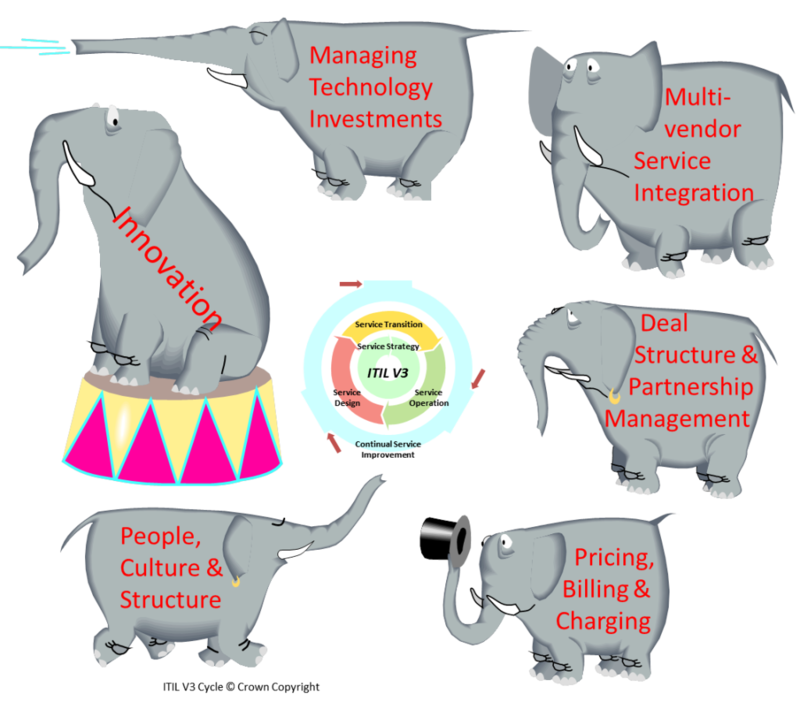 Anyway, my recent revelation is related to this framework below plucked from the world of transformation consulting and change management as relayed to me some years ago by one of my erstwhile consulting chums. The blobs relate to managing communication with people during significant changes on three dimensions: Rational, Political and Emotional. 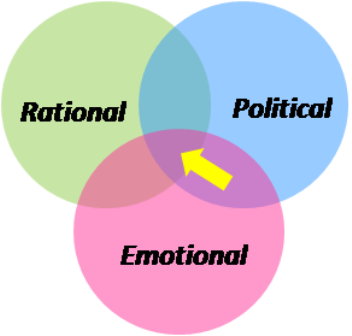 The ‘sweet spot’ is in the centre when all communications are most compelling as they appeal to all these three. Whilst equating Ethos to the Political dimension somewhat turns my stomach when I think of the more venal and self-aggrandising aspects of the political world, the three blobs of the R…P…E model are a pretty good match for what Aristotle laid down. 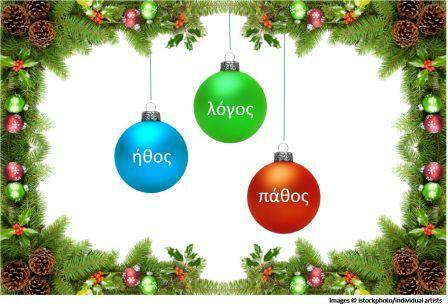 This entry was posted in Uncategorized and tagged Opinion & Humour, People, Strategy on December 31, 2009 by andy. So it has been a torrid couple of weeks for MPs outed having been caught with their hands in the cookie jar. Schadenfreude, Epicaricacy, aighear millteach and their ilk are good words to roll around the tongue, and savour whilst we lob cabbages and rotten tomatoes at those in the pillory: all the more unattractive being that their “misfortune” was brought about by their own actions and a display of lower moral standards than is clearly desirable in our political representatives. I was particularly fascinated and driven to ask “how does that work, then?” by the declaration of one misadventurer that “Of course I feel that my reputation is tarnished, but my integrity is intact”. What logic system do you have to apply, what set of axioms must one have, how must one deconstruct common sense to be able to make this statement? For a start, you would have to look at redefining some core words: unimpaired, anything, upright, honest, pure – take your pick. … a hearty lampoon of opaque and confusing “Management by Cartoon” Powerpoint presentations (one step up, though, from “Management by In-flight Magazine” which is significantly more dangerous). 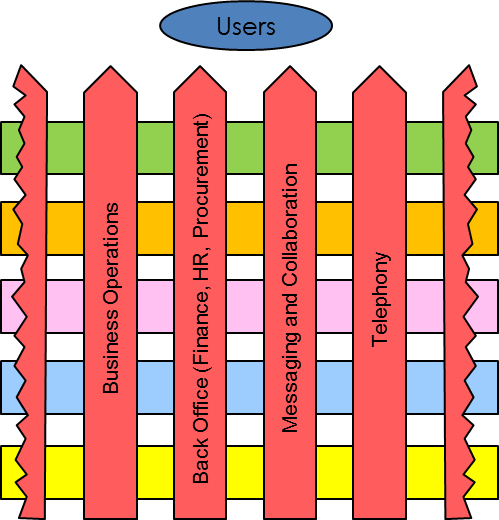 And of course every industry has its buzz-words and jargon, which can be useful short-hand for many forms of communication, but often quite poisonous when they leak into other places. The recent attempt by the Local Government Association to proscribe some logofluvial jargon-words was a valiant attempt to stop etymological pollution in Local Government communication with the rest of us. I am certainly a fan of Plain English, and keeping things short and sweet with some sharp Anglo-Saxon monosyllables replacing loquacious logorrheic verbal peregrinations, but equally a devotee of precision and conciseness which some longer words can bring to a sentence, by conceptual elision, perhaps. “Baseline” is a word I know well that has meaning both in project planning and also in procurement – in both areas being the datum from which you measure some sort of progress or achievement. “Predictors of Beaconicity“, however, is never going to win any prizes for clarity…. And talking of words and in an interesting juxtaposition of neurons firing, I noticed that the BBC were having a Poetry Season. Being a self-professed iconoclast and fact-based sort of person, I have a completely tin-ear for poetry which is just a form of “talking funny” (in an unfunny way, unlike puns). So to finish, I have constructed a Boston grid attempting to make some sense and classify some of the odder behaviours of my fellow human, viz…. 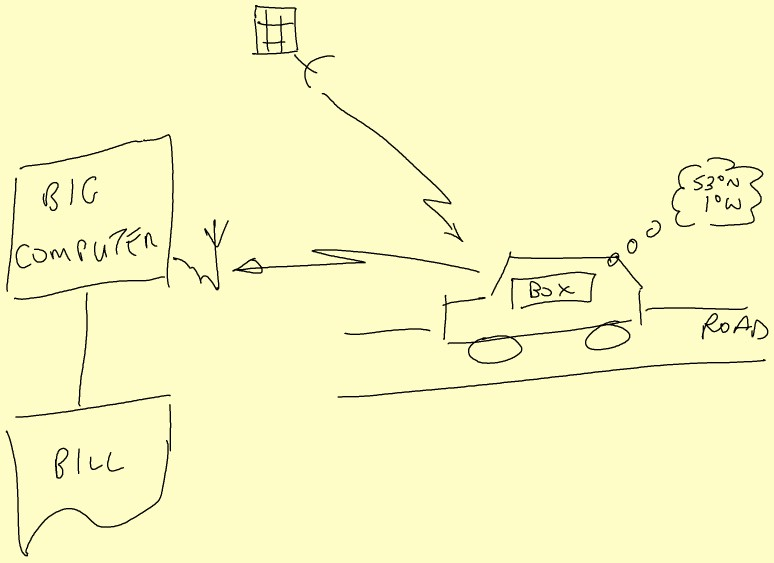 This entry was posted in Uncategorized and tagged Opinion & Humour on May 28, 2009 by andy. So I Googled and Wiki’d and all those searching jobs that normally count as work, and kept finding Tom, Nicole and Stanley and their film, and other flotsam and jetsam on the endless waves of Web surf. But, eventually, I created a mega-whiz, sharp-as-a-scalpel, spot-on search string that gave me that Eureka moment…Ding! Mind you the Eureka moment was over quickly, as I came to that odd feeling that I had never known the word at all so how could I have semi-forgotten or demi-remembered it? But let us not confuse the story with such technical plot twists and devices. I wrote “normal powers of memory” at the top of this piece, though we Jungian Is “enjoy” the physical aspects of memory that are imposed by our brain chemitstry, being the dominant long acetylcholine pathway, compared the the short dopamine pathway of Es out there. …but brighter and probably in colour. So I worked out many years ago that I should not waste my time remembering stuff, when a notebook works much better. And so on into the Wonderful World of the Web, I have always found it useful to clip bits out and paste them into my digital scrapbook for longevity and to act as my long-term cyber memory. I gave up on browser Favourites early, as they quickly became useless signposts to where information was no more. In my Adobe period, I printed bits of the Web to PDF files and stored them in a byzantine filing structure. But, eventually I settled on Onfolio and paid some brass for a real product…and then Microsoft bought it and gave me back my money because they were giving it away free in the Windows Live toolbar…then to become a zombie, twilighting product. The death knell was when they switched off the licensing servers last September. So I had to indulge in one of those distress-driven searches to find a new digital brain. I tried Ultra-Recall which can import Onfolio collections, but has the user experience of a broken lift. I tried TopicScape but that felt like I was in Castle Wolfenstein or Jurassic Park (the ” ‘I know this, it’s UNIX’ whilst looking at a mad graphical computerscape ” moment), and a host of other paraphernalia and arcana. This entry was posted in Uncategorized and tagged Opinion & Humour, People, Technology in Business on April 20, 2009 by andy. 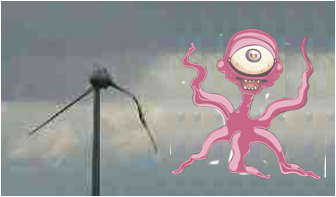 I have commented before about the impact of global warming, but I think having an ocean-going octopus visiting now is rather premature, and in fact any, extra-terrestrial cephalopods foolish enough to embrace a windmill is going to end up as sushi. I was going to write something clever about “interesting times” here but when looking up the origin of the phrase it turns out that the alleged curse has very little provenance – the quixotic and capricious Wikipedia suggest it might be related to the proverb “It’s better to be a dog in a peaceful time than be a man in a chaotic period” (寧 為太平犬，不做亂 世人; pinyin: níng wéi tàipíng quǎn, bù zuò luànshì rén). … and which also makes me think that, in the terms of control systems theory, that the whole global commercial and financial system is large and complex enough not to observable, let alone controllable (although the jury is out as to whether it is quantum indeterminate). 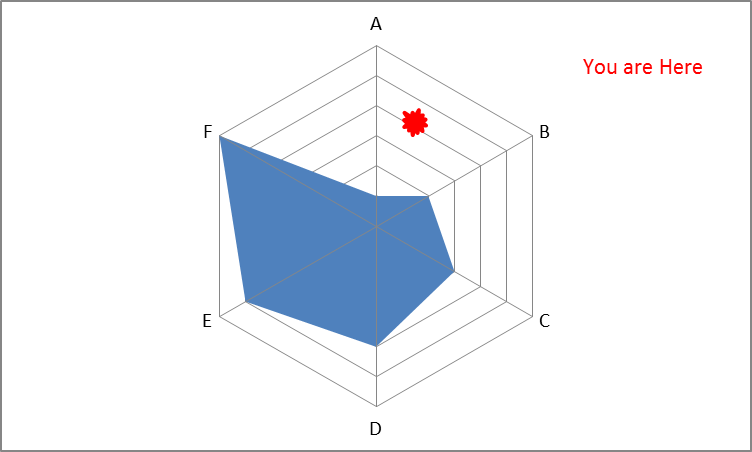 OK I made the last one up, but it demonstrates that PEST is a rather basic cookie-cutter analytical tool, and certainly not MECE in its scope. 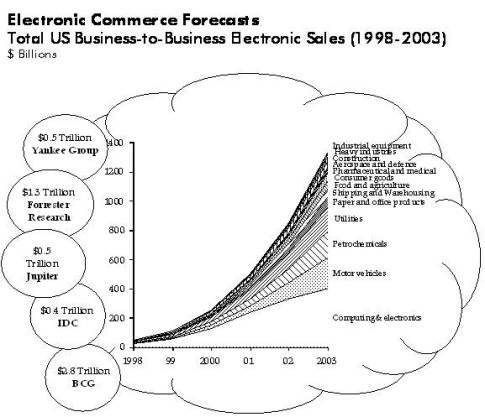 Inevitably, the framework you use for forecasting is influenced by the current frame of reference and warps the lens with which you look at and filter the trends. In the spirit of improvement, albeit strapping wings to a pig, I can offer my own variant: PESTO. The “O” stands for “Oh sh*t”, that category of all other things that we didn’t think about in the other four categories, or plain just aren’t under the microscope, or even do not yet exist, be imagined or people don’t think can happen, and so on. The Red Queen trumps Karl Marx – change is constant and things always move on, become different. Change is, not dialectical, sorry Karl, you backed the wrong horse. The solutions to long term forecasting problems, is to think/work in short cycles, and react/respond quickly to keep up with the changes, and adapt to events as they arise. Be Agile! This entry was posted in Uncategorized and tagged Opinion & Humour, People, Strategy on January 17, 2009 by andy. I recently had to to go to Kent at short notice, and since I was heading into relatively unknown territory on a long journey, I zero’d my satnav trip details, a rare event. 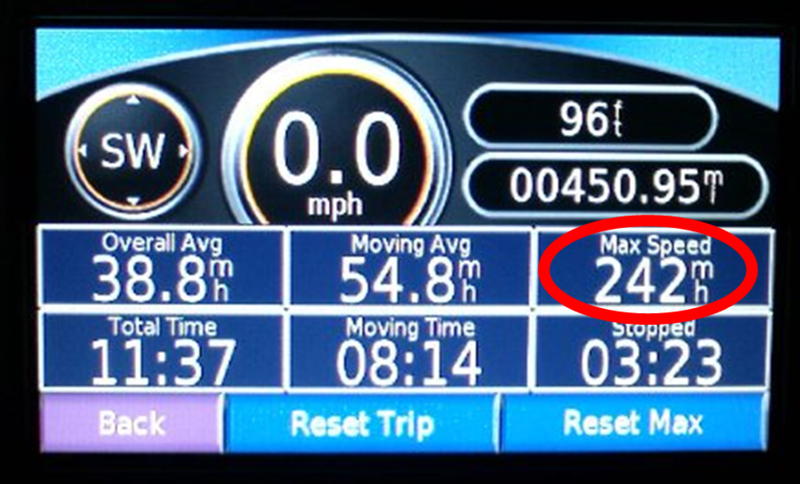 The distance looks right, but behold, my Max Speed was apparently 242 mph – was I driving a Bugatti Veyron (top speed 258 mph)? – I think not! This makes you think about how useful is GPS data as the foundation of a national road pricing system – the answer is probably in chocolate teapot territory! …with the satellites somehow detecting the position of your car and then transmitting the data to the Big Computer that adds up the price of the the roads you have been sitting on, and then issuing a bill. 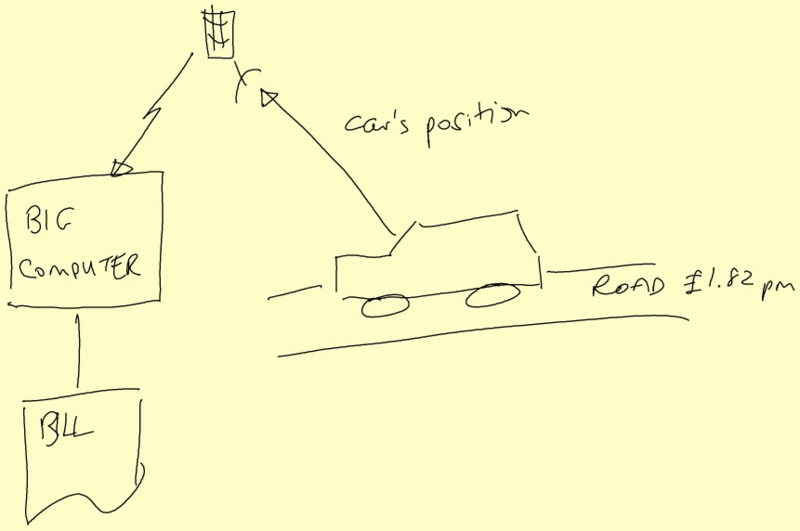 But of course the satellites don’t detect the position of the car at all, it is the Black Box in the car that does all the work, and so a GPS-satellite based road pricing system would really work something like this…. If such a system were built, then once people twig the way things work, the little Black Boxes will be wearing tin-foil hats – to block the incoming satellite signal, and then to stop the mobile phone signal going out; result: No road travel data = no payment. So the Power-That-Be would have design some sort of method of enforcement. 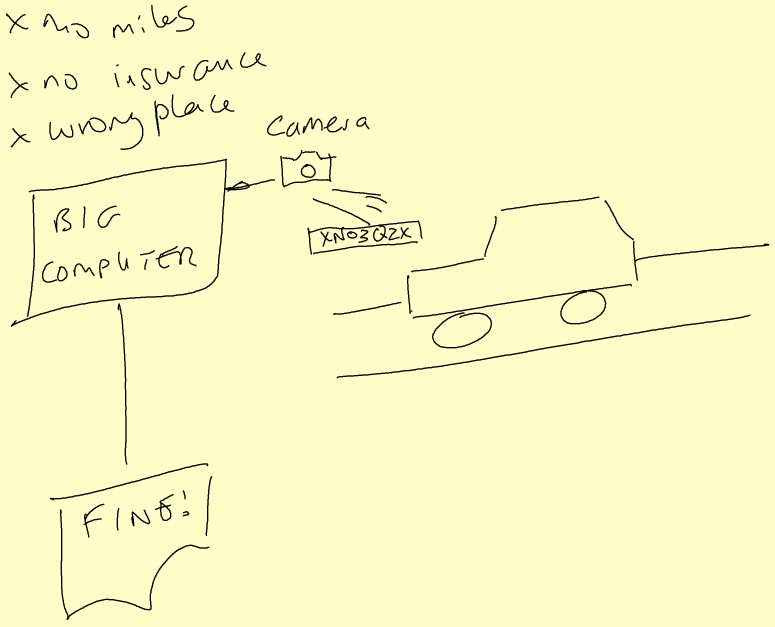 What better way than using the Automatic Number Plate Recognition (ANPR) cameras that are sprouting all over the place. Aaaaaaaaaagh, a merry feast of error compounding upon error, a veritable panoply of tainted data, a concatenation of absurdity! My trip would have earned me about 18-points on my licence, a big fine, a 5-year ban, and probably 6 months in chokey for apparently travelling at 182 mph faster than the National Speed limit. So if/when we end up with a GPS-powered road pricing system, expect the worst! This entry was posted in Uncategorized and tagged Mobile, Opinion & Humour, Paranoia & Mad World on October 20, 2008 by andy.